Lady luck has struck twice on Cooloola Coast Youth Activity Project money boards. Pam Smith won two prizes on the same day, so you just never know when the numbers will be in your favour. 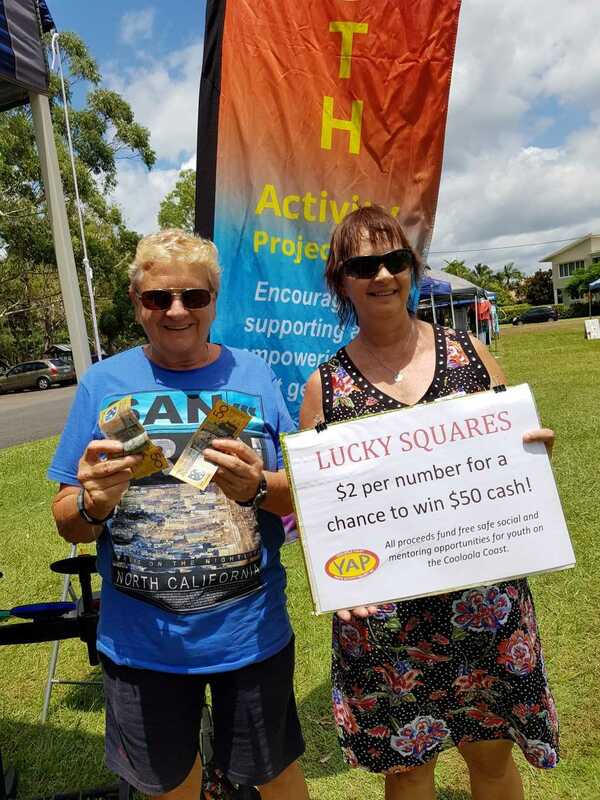 Take a chance at winning $50 cash by buying a square at the Tin Can Bay and Cooloola Cove YAP market stall. Fundraising has provided the next round of insurance coverage and activities. Thank you to everyone who has donated items or supported the busking hat. If you have unwanted goods then give Jess a call to arrange pick up. Contributions raise funds to encourage, support and empower the next generation. 10 – Belly Good 10-11am at the Cooloola Cove Veterans and Community Hall. A light hearted morning that will get your tummy moving! 31 – Easter Craft 10am-2pm at the Easter Fair in the Tin Can Bay Community Complex. Want a chance to dress up as your favourite hero or villain? On Saturday March 24 put on your best outfit and dance the night away from 5pm – 8.30pm at the Tin Can Bay Community Complex. $5 entry includes a snag, zooper dooper, glowstick, lucky door ticket and water all night. There will be awards for the best and most original costumes, games and competitions. Grab your mates and have some fun! All YAP enquiries email cooloolacoastyap@gmail.com or contact Jess Milne on 0411 218 254. Would you like to be a member of our Cooloola Coast Art Group?